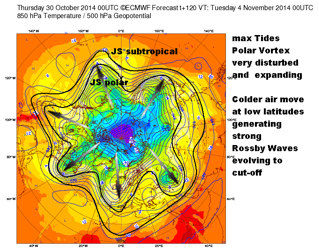 Variations in the Polar Jet Stream directly affect weather across Europe and North America. Jet Stream dynamics are governed by the development of planetary Rossby waves driven by variation of the Coriolis force with latitude. Here we show that increasing atmospheric tides induce the development of Rossby waves, especially during winter months. This changes the flow and direction of the Jet Stream, as measured by the Arctic Oscillation (AO). 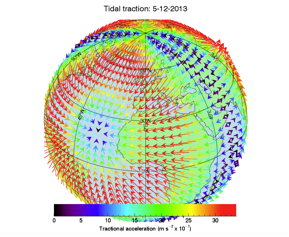 Although horizontal tidal forces are tiny (107 smaller than gravity), they act over huge areas dragging the Jet Stream flow southwards in regular pulses as the earth rotates. This induces a changing Coriolis torque, which then distorts the Jet Stream flow. The data from eight recent winters are studied indicating that the AO is anti-correlated to the horizontal “tractional” component of tides acting between latitude 45N and 60N. The observed 28 day cycle in Jet Stream flow and extent has a statistical significance > 99%. 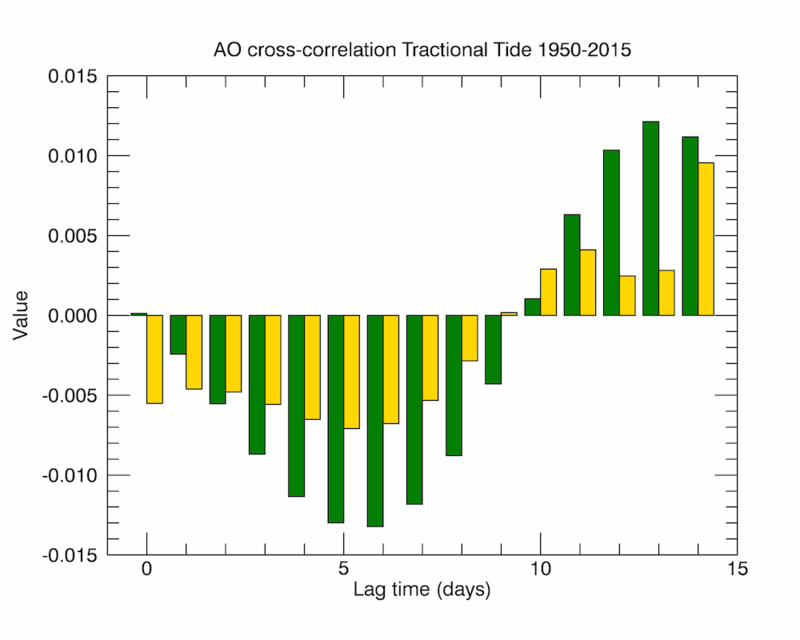 A cross-correlation between all daily AO data since 1950 and the tractional tidal strength shows a significant anti-correlation with a lag time of ~5 days. 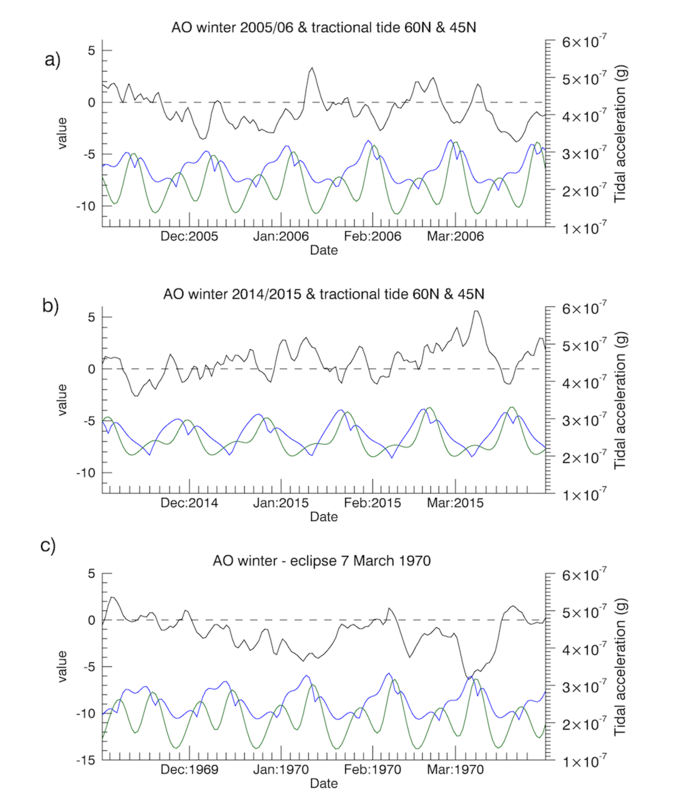 The strongest correlation and largest excursions of the AO are observed during winter 2005/6 – a maximum lunar standstill year. This declination dependence of tidal forces at high latitudes is the proposed cause of many previous reports of an 18.6-year dependence of continental rainfall and drought. We oberved a clear anti-correlation between the arctic oscillation and the horizontal (tractional) tidal force acting at high latitudes. The effect is strongest in winter months when the polar vortex is stringest and increases with lunar declination and during eclpises. a) Variations in the AO which show an anti-correlation with the tractional tidal forces at 45N(green) and 60N(blue) during the Maximum lunar standstill (2005/6). b) A similar study for the current Winter 2014/15. A steep drop in AO is observed coincident with the solar eclipse on March 20. c) A previous total eclipse, which occurred on March 7 1970 and produced a similar steep drop in AO. Lunar declination in 1970 was near maximum. There is also a small but very clear anti-correlation with a lag-time of ~ 5 days across the full 23,800 day series of AO data from 1950-2015. Cross-correlation of the Arctic Oscillation with tractional Tidal acceleration since 1950. The green values are for the tractional acceleration at 45N and the gold values are those for 60N. Both are anti-correlated to the AO with a time lag. The 45N component in particular shows a lag time peaking at 5 days. The cold winter of 2010 corresponded to a Jet Stream positioned lower over the UK drawing cold air down from the North and East. A negative value of the Arctic Oscillation corresponds to a low-pressure difference between the Icelandic Low and the Azores High resulting in a weaker Jet Stream with larger meandering loops. This allows cold air to spill down from the Arctic and Siberia into mid latitudes. During the winter of 2013/14 a strong Jet Stream was positioned directly over the UK and a string of powerful storms caused extensive coastal flooding. It was striking how several of these storms also coincided with high spring tides, for example those of December 5th 2013 and January 5th 2014. The severe storm on 5th December 2013 coincided with a spring tide. So too did the devastating storm on January 4th 2014 bringing coastal flooding to the west country. In winter the new moon generates the strongest tractional tidal forces at high latitudes. . This leads to a 29 day lunar month cycle in maxima The tidal field as calculated for December 5th is shown on the left. The red maxima coincides with the arctic circle. The effect is increased again for a lunar standstill, when the declination reaches its maximum. The orbit of the moon is pitched at an average angle to the equatorial plane of ~20 degrees and precesses with an 18.6 year cycle between 18.5 and 28.5 degrees. This cycle causes small changes in the lunar tides acting both of the ocean and the atmosphere. More importantly it changes the latitudinal strength of the tractional tidal forces. If tides affect the strength of mid latitude storms and their tracks then one would expect changes in rainfall distribution. There are over 50 papers reported over the years showing evidence that droughts in the centre of large continental land masses do indeed follow an 18.6 year cycle. A long series of studies by Robert Currie found has evidence of 18.6 year cycles in rainfall over Patagonia, India, and mid west America. 2005/2006 was a lunar standstill year and there were net swings of the AO index through absolute values of ~6 between consecutive new moons. that winter. We propose that the net increase in lunar induced changes to the Jet stream flow are the cause of the observed drought cycles. This entry was posted in climate science, Meteorology, Physics, Science and tagged Jet Stream, Tides, Weather. Bookmark the permalink.